Photo: Ahmad Bradshaw is bidding for the starting quarterback job. Below, Mike Krzyzewski and Army head coach Bob Knight. Captain Mike Krzyzewski (U.S. Army retired) and Army West Point plebe Ahmad Bradshaw are separated by a couple generations and wars spanning decades, but the past and present Black Knights share more in common than their Chicago roots. Krzyzewski gave in, playing point guard for Bob Knight. He led Army to two wins in the 1969 NIT tournament back when the NIT field meant something. He doesn't have to be prodded to admit his parents were right. Bradshaw grew up on Chicago’s South Side in violent neighborhoods – the kind that makes network news for gangs, crime and teen-age death. Or maybe it could have been a scene from upcoming Spike Lee movie "Chiraq." Bradshaw played quarterback at Gwendolyn Brooks College Prep for a coach he considers a mentor, former Eagles coach James Brown. It’s more than sentimental emotion for Brown. Bradshaw and other players Brown has sent off to college provide a successful contrast to the anguish that stays with him for the kids he couldn’t save from Chicago’s South Side. The future that Brown long ago saw in Bradshaw also was spotted by veteran Army assistant coach Tucker Waugh. He identified Bradshaw’s talent along with his strong academics and leadership qualities. 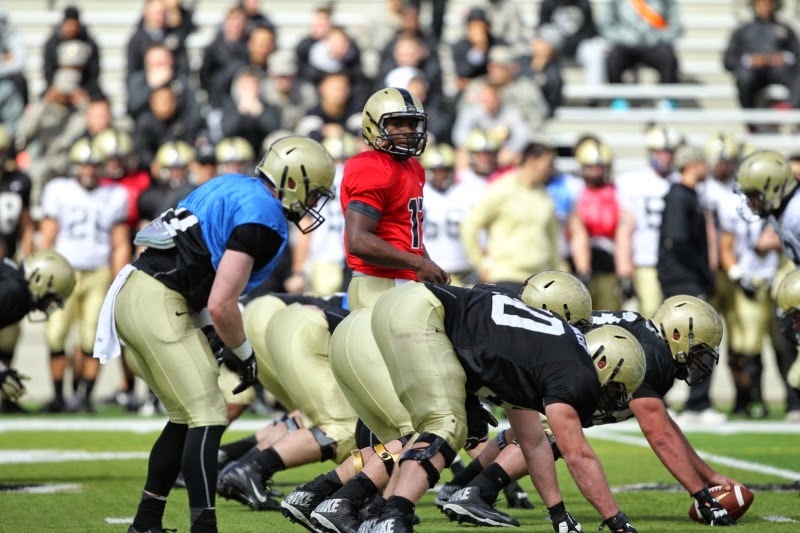 The 5-foot-11, 196-pounder also fit Army’s triple-option offense, having directed spread and option offenses at Brooks. Brown welcomed Waugh's recruiting pitch. Included in the discussion was Bradshaw’s mother, Kizzy Collins. She had established a foundation despite struggling as a working single mother raising a son in a tough neighborhood. That included unwittingly preparing the future officer for the challenges he would face to survive a challenging military academy lifestyle. He believes he's on a path to becoming a West Point leader, drawing on the example of his high school coach. That made it easier for Bradshaw to accept Brown’s advice when he saw West Point provided a promising future. --- Tom Shanahan has featured Army, Navy and Air Force athletes for nearly 30 years in the San Diego Union-Tribune, Rivals.com and the Raleigh News and Observer. He attended his first Army-Navy Game after John Feinstein wrote in his book on the rivalry, “A Civil War,” that everyone should attend the Army-Navy Game at least once.